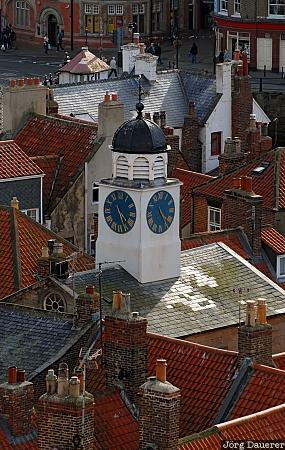 The white steeple of the tower of Market Hall between the maze of roofs of Whitby. Whitby is on the coast of North Yorkshire, United Kingdom. This photo was taken in the afternoon of a rainy day in September of 2007. This photo was taken with a digital camera.